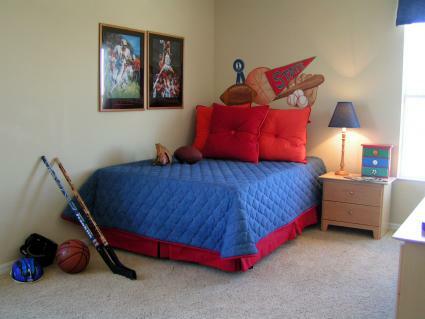 Sports themes for boys' bedrooms are an extremely popular way to add some personality to little guys' rooms. In a world of interior design for children geared more towards little girls, sports themes are a choice for boys for which there are plenty of materials available. Best of all, within the realm of sports themes, there are lots of variations, which means your little guy is likely to find something that is just the ticket. Before you start any design project, it always pays to make a plan. When you're decorating children's rooms, you should try and include them in the design process in an age appropriate way. For younger kids, talk to them about their favorite sports or favorite teams to get some ideas for what to include in the room. Older boys can help pick out colors, furniture and accessories. Another important part of your planning process is to make a budget. Going shopping armed with just a credit card and some vague ideas can be disastrous on two fronts; you'll end up spending way too much money, and you'll end up buying the wrong things. Come up with a reasonable budget for the entire project and then for each portion of the project - paint, bedding, accessories, etc. If your sports enthusiast has a favorite team or sport, you may have a natural starting point. If your sports lover plays and watches several sports, you may want to choose one to incorporate into a theme, or use elements of several themes at once. There are several ways you can introduce a love of sports into your boy's bedroom decor. From subtle to total makeover, try any of these ideas. One way to begin your sports theme and get a great jumping off point for colors is to begin with the bedding. 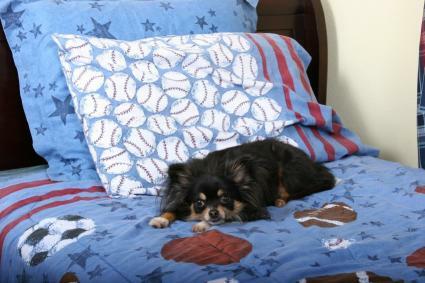 Start with either a generic sports themed bed cover and pillows, or stop at a team store, such as the NASCAR store, to find bedding for your son's favorite team. If there are matching drapes, curtains, rugs or throw pillows, add them for an instant themed effect. Consider purchasing some team merchandise from your son's favorite team or teams to add a personal touch to the room's theme. Use pennants, jerseys, balls, basketball hoops, baseball bats, old photos of players or stadiums and framed trading cards to go beyond the generic. Scatter these items throughout the room or group them together in a trophy case for a focal point. Pull the room's wall colors from either the bedding or use your son's favorite team's colors. Create an accent wall in one bold color and use lighter colors for the trim and remaining walls. Use this accent wall as a backdrop for all your sports themed merchandise and other items you wish to display. Put up some inexpensive vinyl wall art of helmets, gloves, balls, bats and hockey sticks to put the finishing touches on the design. Add them to the walls or the furniture; they peel off easily without damaging the paint behind them. Many designs can be customized to include your child's name or number to make the wall art truly stand out. Remember as you create your themed bedroom that children grow and their tastes change. What interests your son today may not interest him in five years, so consider this as you make your purchases and plan your design. To avoid expensive remodeling costs down the road, keep the bulk of the theme to easy-to-change-out items like bedding, curtains and hangable wall items. This will ensure your sports themed bedroom looks great now, and if that love of sports ever comes to an end you still have plenty of blank canvas to work with.